In our Writing 222: Introduction to Rhetoric class this fall, we started out by playing with the terms “ideology,” “commonplace,” and “truth/Truth” (through the lenses of the Platonists and Sophists). For those not familiar with these terms, Plato and his gang believed that we could (and should) use rhetoric and philosophy to reach the Ideal (Truth). The Sophists (including Isocrates) said, “Eh.” They were more concerned with the role of language in the everyday sphere, in how humans used language to negotiate the complex reality of everyday life. For those who do know these terms, forgive my reductionist interpretation for the sake of time and space. Hold on…I’m going somewhere with this…so if your eyes are glazing, snap to! So after reading these passages, I see this morning on my Facebook news feed an interesting image. Hmmm…I thought. My immediate reaction was a lump somewhere in my gut (as most sensate humans — particularly those with offspring — will react given the emotional appeal of the visual). But removing the visual, you are left with this sentence. Of course, taken on its own, this sentence is a logical fallacy. 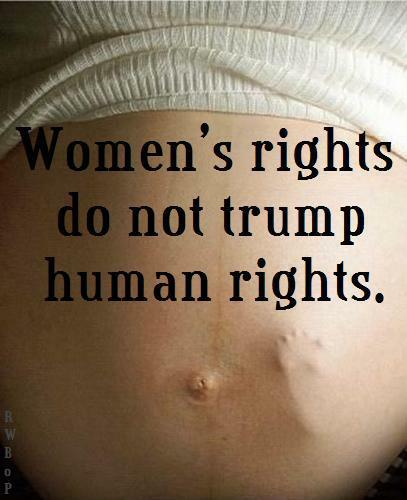 Women’s rights and human rights are not two opposite ends of a spectrum. Last time I checked, I am both woman and human (even though I feel like a robot some days). But one might say this is an argument of degree…one of the two sides (still a false dichotomy) is not more than the other. But it also isn’t less than the other, which is the opposite or tacit side of that argument. And the practice of that ideology often plays out in emotional posts to Facebook, or shouting rants on circus shows or television. The points our WR 222 textbook make quite eloquently are that opinion, when tied to personal identity, cannot afford the playful nature of considering opposite sides, and that rhetoric comes into play at exactly this point: the point at which we disagree about ideology and the commonplaces that underly it.